So many new cams are coming to the market in 2016 (not to mention the 2015 revamped Metolius cams) that it almost seems like a conspiracy. Or at the very least, an industry-wide memo proclaiming this – the year of the cams. In this post we will be detailing all the upgrades that are coming to the cam world in 2016. The biggest news for the Ultralights is that they’re 25% lighter, on average, than BD’s C4 Camalots (depending on the size the weight decrease is approximately 21-29%). The Ultralight C4’s have the exact same camming range and lobe profile as the regular C4’s. The majority of the weight savings comes from the continuous loop of Dyneema (patented) that replaces the steel cable and swage in the stem. The new flat-taped sling also reduces weight compared to the burly nylon on the C4’s. Black Diamond will be offering their re-slinging service for these outer slings but the inner Dyneema loop that makes up the stem will not be replaceable. The lobes also lost weight, which does mean they won’t be quite as durable; they’re not workhorse cams. If you’re a climber who beats on their gear or has worn through the lobes of any of your previous cams you would be advised to shy away from the Ultralight C4’s unless you plan on more gear-considerate climbing. Worth noting: The strength of the Ultralight C4’s is 2 kN less than the C4’s, making the Ultralights on-par with other lightweight cams. At BD the Ultralight C4’s were originally referred to as the “Alpine” C4’s since anyone carrying a rack long distances would find the most benefit from the weight-loss. In the end, the “Alpine” name was not used as it would have been limiting. 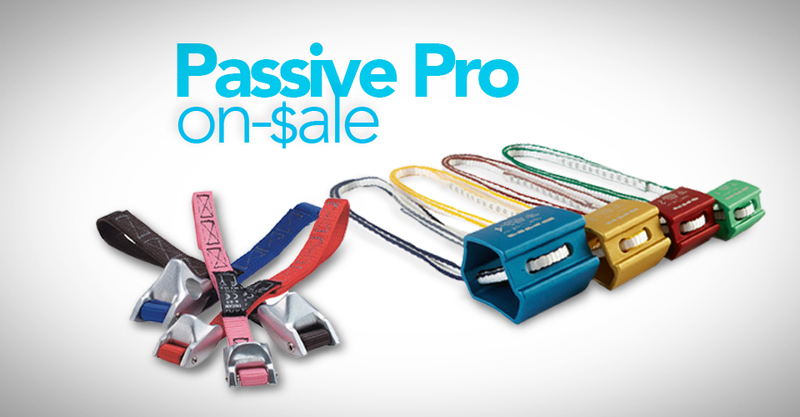 Any climber with a full rack will find satisfaction from the decreased weight on their harness, whether cragging or big wall free climbing. The worst criticism of the C4’s we’ve heard is: “These cams won’t last as long because the Dyneema stem will wear out quickly.” BD’s Climbing Category Director, Kolin Powick, has assured us this isn’t the case. 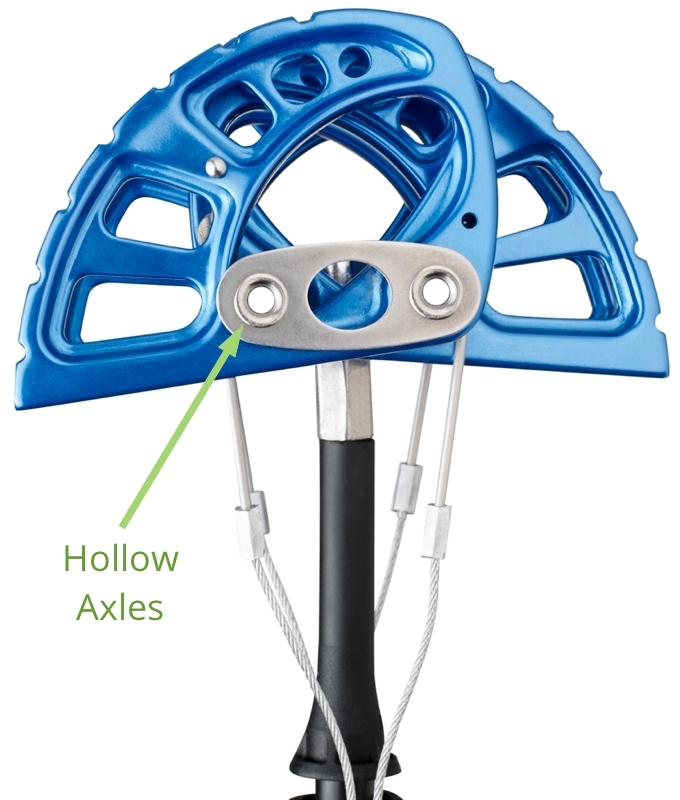 Similar to the C4 steel stem, the Ultralight stem is still protected from abrasion via a plastic sheath. If you chew through this plastic to expose steel (on the C4’s) or Dyneema (on the Ultralights) it’s time to retire the cam. Otherwise, you can trust that the cam is not wearing out on the inside. 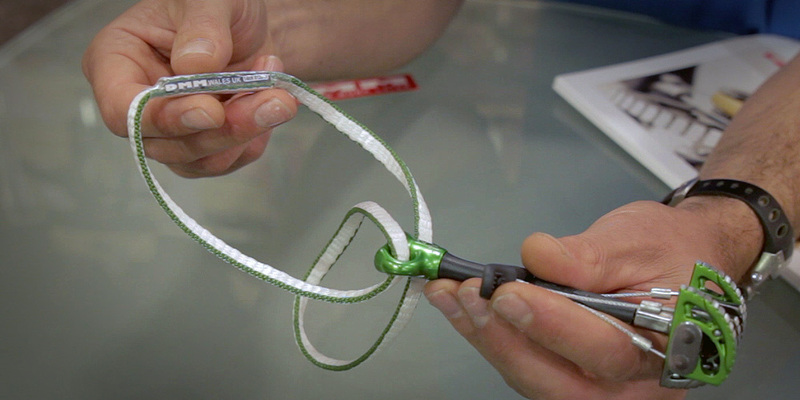 But what about UV impact on the Dyneema visible in the thumb loop? The transparent plastic is in-fact UV proof and negates any the UV degradation concerns. If you take care of your gear, these can last as long as your C4’s, Kolin says. In other cool news, BD has recently brought all their hardware manufacturing back to Utah, so these babies will be made, anodized, and assembled in Salt Lake City, USA. For now the sizes are restricted to .4 – 4. More sizes may be added in the future but the percentage weight savings compared to the C4 will be less on larger sizes like the 5 & 6 (and the average Ultralight rack weight savings would turn into something like 20% instead of the 25% average they tout today). When DMM set out to update the Dragon cams they were looking for more grip and friction. So they brought in some Cambridge University interns and had them look at all sorts of rock types and friction and how they relate to lobe design and the surface area of the cam. The results of that study suggested the following: increasing the width of the lobes, eliminating the anodization on the contact surface, and adding more grip to the lobes (DMM is calling this “TripleGrip”). By creating additional texture with corners and grooves that add more friction, they have accomplished all three objectives. The results of these changes mean the updated Dragon cams will have more bite in soft rock like limestone but will see little difference in hard rocks. Sidenote: Some British limestone climbers actually scrape new cams on the pavement to rub off the anodization for extra grip. During Dragon cam production, after the cams are forged, they’re CNC’d to create the axle holes and lobe holes. 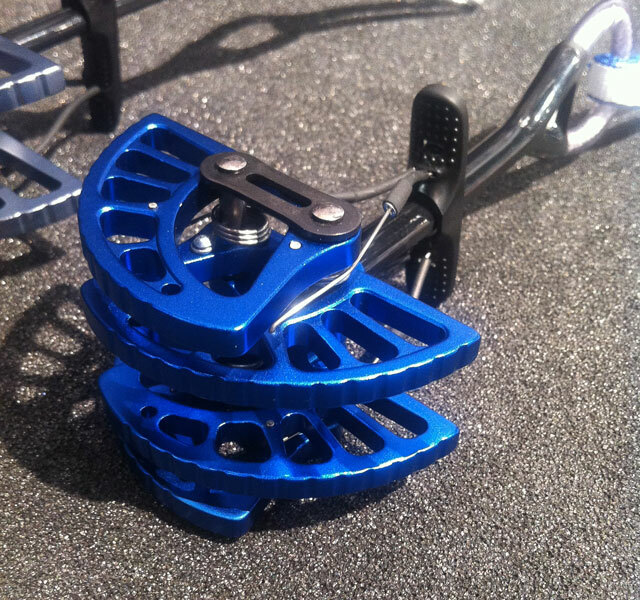 The cams are then sent out for anodizing. After anodizing the entire lobes, they are CNC’d to remove the contact surface anodization. DMM accounts for this removal of metal from the new lobes in the design process (so you’ll be getting the same amount of lobe metal as before). Then the grooves are added to the lobes and the axle holes are reamed out to ensure incredibly tight tolerances. This new process and improved tolerances will decrease the chance of cams bending and aims to reduce walking compared to the previous version of the Dragon. The lobes will continue to have the standard 13.75° for the usable cam range. To save weight, you’ll notice the lobes are tapered and slightly narrowed at the tips, beyond the expected usable range. Overall the Dragons will be marginally heavier than in the past due to the wider cam lobes. One detail that DMM mentioned nonchalantly but we consider substantial is the updated sling. There is a new stitching pattern that creates less tail so it’ll move through gear easier. The stitching is also covered in heat-shrink tubing creating a super streamlined sling. The new stitching pattern enables the cams to be rated at 14 kN regardless of whether the sling is doubled or extended. Previously the extended sling only carried a 12 kN rating. The thumb press was also updated though most of the changes were for manufacturing purposes. The only noticeable change is the area where your thumb sits now has a larger depression. The Demons benefited from all the work done on the Dragons: you’ll find the same updated sling technology and thumb press found in the Dragons. The Demons no longer carry anodization on the lobes to improve grip and increase visual difference between Dragons and Demons when looking down at your rack. The New Friend is Wild Country’s debut into the dual axle cam world. They take an interesting spin on the concept with hollow axles that save weight and according to Wild Country are actually stronger. You’ll also notice the hot forged lobes have no anodizing on the contact surface and the heads are wider than the previous Friends. Wild Country assures us the 13.75° camming angle they originally came up with is here to stay. The New Friend incorporates a shorter trigger which will be benefit smaller handed folk and cause less fatigue for any pumped-out gear plugger. There are hard stops on the triggers as well. The extendable sling means the cam will be rated for 10 kN when fully extended and 12 kN when doubled. When we inquired about potential thumb loop deformation, WC responded that they’ve gone through lots of testing and the injection molded thumb rest along with the encased steel swage thumb loop will not deform with the 12 mm Dyneema extendable sling. As many climbers have pleaded for, Wild Country New Friends now align with what is becoming the industry standard for cam colors (consistent with BD Camalots). So now if your guide book says take extra reds or yellows, you’ll know what to do. Although there will be limited sizes to start out, from .5 – 4, the Technical Friends will still be available in sizes 5 & 6.